Technology Readiness Levels (TRL) were first defined by NASA in 1989 as a method of classifying the maturity of a technology or product during its development and acquisition. Originally seven in number, this was increased to nine in 1991 and the concept has since been adopted by other organisations. In 2009, the European Commission published a paper entitled ‘Preparing for our future: Developing a common strategy for key enabling technologies in the EU’. This introduced the concept of Key Enabling Technologies (KETs) as foundational technologies on which industrial prowess depends. These were listed as nanotechnology, advanced materials, biotechnology, micro- and nano-electronics (including semiconductors), and photonics. These KETs were already using the concept of Technological Readiness Levels, due to their contacts and contracts with the US Department of Defence, as a measure of how far a technology is from being ready for use in its intended operational environment. The Industry is aware of the opportunity and may have some ideas about implementation and high level benefits, but does not have a clear route to market, a defined customer or a good understanding of the manufacturing process. Thinking, supported by research, to develop understanding of need and possible approaches to obtain qualitative benefits. Opportunity is defined to the state that the Industry is able to conceive plans to develop the necessary facilities required for delivery. Co-operation and co-financing amongst several independent entities may be required, but no business case exists as yet and barriers to implementation are not understood. Conceptual design supported by experimentation proves viability and feasibility of the concept. Initial business and production plans, with associated test, qualification and certification are available. Draft business case is developed and end customer is identified along with analysis of their needs. Qualitative plans to deliver the concept are supported by positive market and business analyses. Technologies required to manufacture/produce or deliver are understood and associated facility capability planning is underway in accordance with the Market potential and supported by the Business Plan. Customers and suppliers have agreement on how realistic demonstration of the research project might be undertaken. Prototype assets and/or services, developed under quality controlled methodology are available. The Industry is capable of pre-production using bespoke processes and able to deliver ‘pre-production standard’ goods and services in support of whole system and market development. The conditions for implementation are understood. Agreement between project partners stipulates how the successful project should be exploited. Supply of goods and/or services of appropriate and repeatable quality meets market needs.. The Industry is capable of repeated standards of production to the required levels, and realistic operational demonstrators are in place. The competitive landscape is understood. Operational credibility builds as goods and services are employed, feedback used to confirm user expectations. Low level production begins to ramp up to full production rates in a controlled and planned manner that matches demand and marketing strategies. No barriers from legislative or standardisation point of view exist. The technology is incorporated in to the wider system. Manufacturers are established and ready to deliver. Supply meets demand in a timely manner, product / service deemed mature and deployable with ease. Steady state production output is sustained with supply able to meet demand, with products and services at a mature and qualified state. The product / service is exportable. Customers start to implement the technology because of strong business case, customer or legislative compulsion. Continued product / service improvement; business as usual; actual whole life cost measured. Products and / or services are mature with the ability of being supplied off the shelf’ to meet expanding demand; with the opportunity to undertake a reasonable level of tailoring to meet new markets. The product / service is in world-wide usage. Many projects run into trouble between RIRLs 4 and 7. 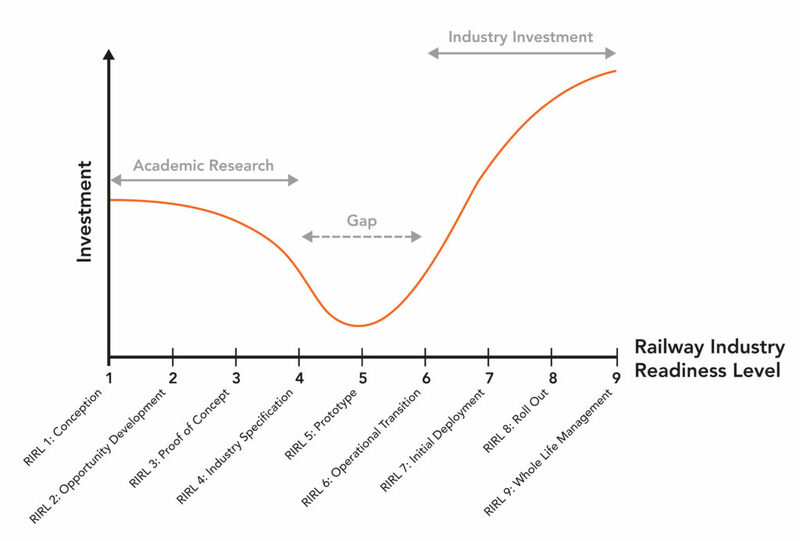 During the Research and Development stages – RIRL 1-3 – work is funded by academia or by company R&D budgets. However, once RIRL 4 is reached, and the need to develop a working prototype in RIRL 5 and operational demonstrators in RIRL 6, the costs start to ramp up. R&D budgets may no longer be adequate so external funding is required, but this can be difficult to when the development process is incomplete. This struggle to continue funding development is often termed the ‘Valley of Death’, or the innovation gap. Many projects founder at this point, not because the technology or the idea is lacking, but due to the inability of the project team to convince funders of its future potential. Involving an industry or academic association can be useful, government funding may be available, perhaps on a matched basis, but the Valley of Death is a real problem for many projects. Once out the other side, with working demonstrators and after a successful trial, then ‘big business’ can get involved to take the idea through to production.